The latest generation range of Mercedes-Benz Sprinter panel vans have just gone on sale here. Priced from €21,950, excluding taxes and charges, the spaciously-large, high-spec, high-tech Sprinter brings new levels of intelligent connectivity and superior comfort to the LCV market. And for the first time, a front wheel drive version is available, plus a new three-years warranty is now standard across the entire Mercedes–Benz van range. In every department, this latest Sprinter embodies attributes that have made it a popular choice in the large van segment worldwide. First introduced in 1995, Sprinter has sold in excess of 3.4 million units worldwide, driven by its flexibility, robustness and economy. Here in Ireland all previous Sprinter models have won the Irish ‘Van of the Year’ award in the years of their introduction before going on to become the distribution vehicles of choice among many high-profile names in food, drinks, courier, parcels, and in engineering, manufacturing and servicing sectors. In designing and equipping the new Sprinter, Mercedes-Benz had the goal of surpassing its two predecessors by recognising the requirements of those major customer groupings which it says has become a frontline choice. The challenge was to improve an already successful vehicle by making beneficial use of latest technology – some drawn from its passenger cars. In this, the key objective was to increase the Sprinter’s appeal to customers keen to achieve optimum fleet utilisation, greater economy and reduced operating cost. That these goals have been achieved is evident across the board. In simplest terms, enlargement of the load volume and lowering of the rear floor height give an immediate fillip to those seeking more load-per-movement and greater ease-of-access for drivers. This latter feature is evident also in improved cab comfort and driver access thanks to the offer of front-wheel-drive within the engine mix. Equipped with all of the features buyers look for in a panel van, this latest Sprinter comes with a progressive new design and passenger car levels of comfort and safety. Hallmarks include a generous load volume and carrying capacity, the addition of front wheel drive, and a new infotainment and connectivity system, the benefits of which will be seen in better fleet management, lower operating costs and maximum cost effectiveness. Arguably, its most innovative feature is a new networked, online connectivity system that gives operators comprehensive fleet control. These easy-to-operate additions – Mercedes PRO Connect and new MBUX multimedia system – ease the process of fleet management, whether of a large, multi vehicle business or a small company fleet. Functions monitored include vehicle operation and supervision, fleet communication, maintenance management and a digital driver’s logbook. Thanks to the availability of front-wheel drive and an 80mm-lower load compartment floor within the mix, owners can now benefit from the added load space and cargo capacity available, all within the same body height. Drivers can reduce their workload and experience less toil by being able to access the rear more easily. Of increasing importance also is the booming food delivery sector. Appealing to operators in this market will be the introduction of an e-Sprinter version coming on the market next year. Other targets will include service technicians who use their vehicle as a mobile parts store and workshop; construction operatives requiring a crew carrier that can handle punishing ground conditions; trades people seeking a well-designed and equipped van with good image-building qualities; shuttle service, minibus and passenger transport providers. Included also are specialist users such as ambulance and rescue services, executive coach companies, camper van aficionados, and others needing to build a vehicle on a chassis/cab or long wheelbase to meet individual requirements. The new Sprinter is available in six different body variants in five wheelbase options from 3250mm up to 4325mm (rear-wheel drive ) or 3924mm (front-wheel drive ). There are three diesel variants developing between 84 and 130kW power output. Three body heights range from 1,719mm to 2243mm. It comes in five weight classes with load compartment volume increased up to 17cubic metres with 5.5 tonnes capacity, three drive configurations – front, rear and four-wheel drive – LED strip lighting in the load compartment, and a towing capacity up to 3.5 tonnes. Sliding offside access doors and split-opening rear doors give easy access to the load area – rear doors being fitted with self-arresting hinges can be safely opened and closed with just one hand. Available loading width of around 1.22 metres between wheel arches means pallets can be loaded sideways. Interestingly, by mixing and matching the new Sprinter’s various features according to needs and preferences, Mercedes-Benz says customers can model more than 1,700 different units to match whatever corporate or individual requirements they may have. Engines comprise a 3-litre, six-cylinder unit delivering 140kW (190hp ) and 440Nm of torque at 1600 to 2600rpm and four-cylinder units in three output classes for rear and front-wheel drive. Like the 3.0 litre version, the smaller four-cylinder diesel engine has common-rail direct injection. From a displacement of 2.1 litres and with rear-wheel drive, this engine generates a choice of three outputs: 84kW (114hp ), 105kW (143hp ) or 120kW (163hp ). With front-wheel drive the outputs range is from 84kW (114hp ) to 105kW (143hp ) and 130kW (177hp ). Gear ranges are graduated to give an optimum balance between low consumption and agile handling. Other virtues include a low noise level and outstanding ride comfort. Two newly developed transmissions for front-wheel drive units include a nine-speed automatic torque converter transmission – a first in the large van segment. A new six-speed manual transmission also impresses with maximum gearshift comfort and no irritating vibrations of the shift lever. Ergonomically shaped seats, keyless start and improved air conditioning increase driver comfort. In models relevant to the CEP sector, front-wheel drive gives the new Sprinter a significant weight advantage with increased payload up to 50 kilos more than its predecessor. Combined with fully usable load compartment heights, clever detailing and loadable wheel arches and a variable stowage concept that ensures everything has its place, the new Sprinter is more versatile and driver friendly. Safety was a forefront consideration when designing the new Sprinter. Its toolbox of standard and optional features includes adaptive cruise control, brake assist, lane keeping assist, attention assist, crosswind assist and traffic sign assist. An optional parking package includes a 360-degree self-cleaning reversing camera whose image is displayed in the rear-view mirror and a rain sensor with wet wiper system in which the washer fluid is passed through the wiper arms and sprayed directly ahead of the blades. Seeing it as an ‘intelligent and perfectly designed successor’ to previous Sprinter models, Mercedes-Benz commercial vehicles sales manager in Ireland, Fergus Conheady, says its innovative use of technology, high-level specifications, and numerous load carrying, driver comfort and fleet management features work “to ensure the Sprinter remains a league-leader in the large van market”. 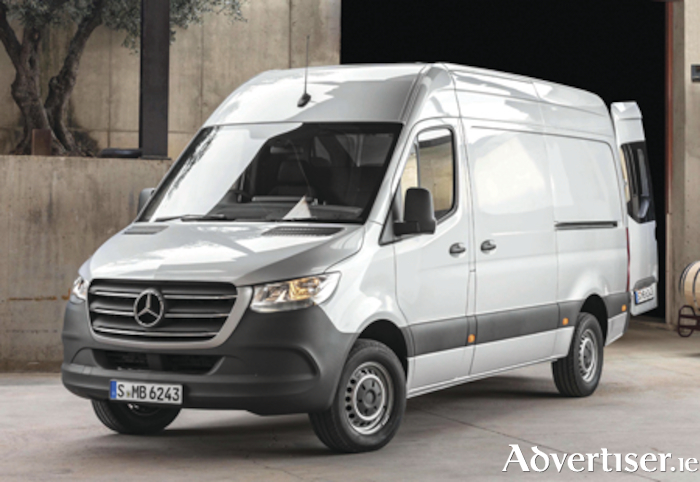 The new Mercedes-Benz Sprinter is the king of vans and it has consolidated its position as the one that all other large vans must try to catch up with.